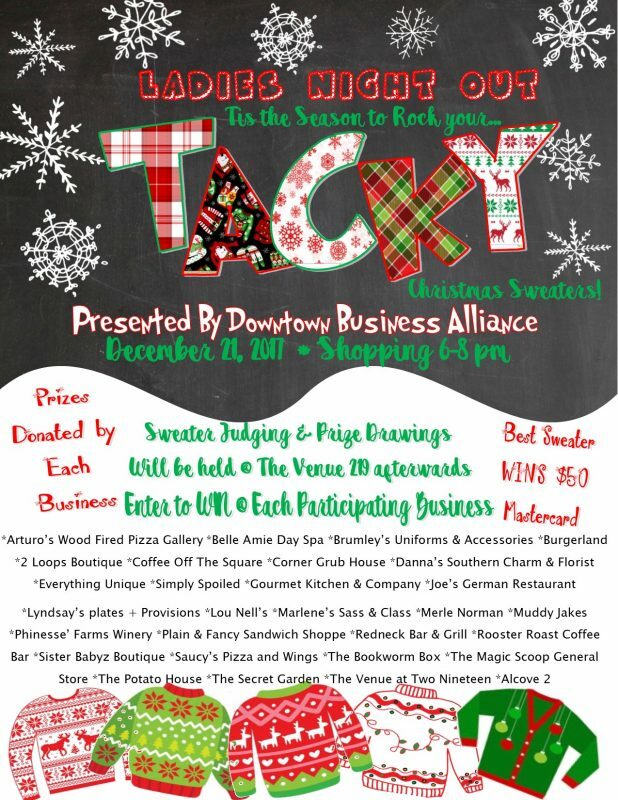 Ladies, “your” night out is on the calendar for Thursday December 21 at 6pm on Main Street downtown. Talk about getting all the fun, food and fashion retailers in one place, the Downtown Business Alliance has done it for this once-a-year event to celebrate the shopping magic of the holidays. What to wear? Your tackiest Christmas sweater, of course! The Best Tacky Christmas Sweater prize is a $50 MasterCard gift card. There are dozens of local merchants sponsoring this event presentation with fabulous door prizes, so visit each one and register while discovering the treasures our shopping districts have to offer. Plan to stick around til 8pm, must be present to win the Tacky Sweater contest inside The Venue 219!